Lucky are those children who are comfortably go to school without thinking if they have an allowance for the next school days. Blessed are those children who are comfortable studying in a well-ventilated room, sitting at their couch while reviewing their lessons, and of course, having all the technologically advanced materials needed for school projects and undertakings. Lucky those children but for Jolimil Reyes, 18 years old, a proud Shielded Metal Arc Welding (SMAW) student, he is luckier compared to those children who experience such because he had learned everything in a hard way. He considered himself fortunate for being able to sell fish ball in barrios after his classes until 11 pm and has to get up at 5 am to get ready for school. He is luckier because from the eighteen years of his existence finally he got his birth certificate and soon he will able to enjoy his rights to really use his last name “Reyes.” He is luckier because after eighteen years he was baptized and may now consider himself as a Christian and Roman Catholic devotee. He is fortunate that he continues senior high school and take the Technological Livelihood Education – Industrial Arts strand, for he has met people who helped him a lot to survive. His journey is not a smooth sailing but a rough ride. Despite the obstacles, his grit and faith in God push himself to go through and in the end, surpassed it all with a “SABLAY” that he will be wearing and awards he will receive on his graduation day. Jolimil Reyes is the youngest child of Shirley Tindoc, 64, and Valentin Reyes, 74. Recently, his parents finally got married despite their age. There is a reason why his parents were not able to marry early because the two already have other children to their first family. Due to family issues, they decided that they did not register the birth certificate of Jolimil Reyes to National Statistics Office for the issue of what will be the last name of the child. Only the “Affidavit of the Surname to Use” is the document he presented throughout his schooling years. “Whenever my teacher was asking me why I still do not have a birth certificate I really feel shy and want to stop schooling, but I only say we do not have money to request for it in Cabanatuan City,” said Reyes. It is true that there is need huge amount of money involved on his birth certificate in which his aging parents could not provide anymore because their income is limited to pay for their bills and to his some schooling expenses. He is losing hope, but through God’s grace, some people sponsored and shouldered the expenses of his birth certificate. “I saw the hardship through my parents’ eyes while we are processing my birth certificate in Cabanatuan City. They are already old, and I should be the one to give them money. They should not be involved in helping me process my birth certificate. We do not have enough money every time we have to go there. There are a lot of supporting papers needed. There are times that I wanted to give up, but I am so much thankful for the people who helped me all the way and who push me to go through,” said Reyes with teary-eyed as he remembered the days they have to go in Cabanatuan City with an exact budget for their meals and transportation allowances. Thus, every time they have to go there they were not able to sell fish balls. Aside from the problem on his birth certificate in which will now soon be settled, he is always thinking of his aging parents that after his schooling in senior high school he has preparing himself to start working. That was his initial plan before entering senior high school, but everything has changed when senior high school molds his potentials to be a leader and to be a successful individual someday. 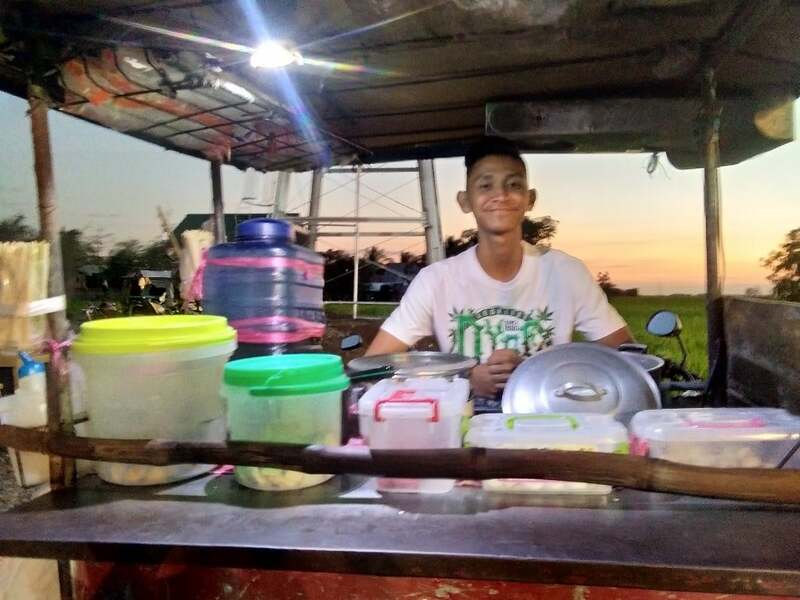 Starting on his junior high school until senior high school, Jolimil helps his parents to sell fish balls in Talugtug, a one-hour ride away from their home in Barangay Pandalla. He goes home immediately after his classes so he can help his parents. It is his ways to help them somehow. “It is really hard for me, but I got used to it. Once I got home from school, I just put my bag, and I am the one who drives our fish ball cart in Talugtug. We will finish at around 10 pm and went home at almost 11 pm. After which, that was the time I have to review my lessons if there are quizzes tomorrow. Then, I have to wake up at 5:00 am usually,” shared Reyes. Reyes who is already mastered his routine every weekday kept himself a promise. “I know that it will end, my economic status in life, once I will graduate and get my college diploma,” Reyes optimistically told and he added that he doesn’t want to be in his economic status forever. “I have to study well, I know that there are more struggles I will be facing especially for financial resources to support my college study, but I will do my best to go on and survive,” Reyes said. Reyes is not sure if he will finish college because of lack of financial resources and another thing is due to the age of his parents. But he is hoping he can get a scholarship and praying that somebody that will send from heaven will finance his college journey. He is dreaming of becoming a Police Officer someday but since he cannot afford to study in the universities Cabanatuan City that offers criminology, he chooses to take the entrance examination in CLSU, and if he passes, he will take BS Education major in Filipino or Science. From all the hard times he went through, from having no birth certificate, no baptismal certificate, selling fish ball after his classes, and of course, from being a TVL-SMAW student, Reyes shared what he had learned, food for thought that is good to ponder on. “To my fellow students, we may face struggles in life in which we will come to the point that we wanted to give up, but we should not because someday we will regret it. We have all our capacities to achieve all the best things in life, and that is what we deserve. My teacher always said always be good and kind, choose what is right, and manners maketh a man, and following such it made me a good man,” ended Jolimil. Robinson B. Valenzona, 24, is a senior high school teacher from Munoz National High School Main, Nueva Ecija. He is a graduate of AB Development Communication and took up a Certificate in Teaching at Central Luzon State University. He is dreaming of a better school system here in the Philippines.